Long goatee styles are some of the most rebellious beard styles you can choose. Long goatees are reserved for men who want to show off their voluminous beards. Long goatees are a style of choice for a lot of rock start, for younger bold men and for older gentlemen. Because they suit so many different types of men, long goatees are pretty versatile. Go through this list of breathtaking long goatee styles and pick one that speaks to you the most. Long goatees are fashionable and there are no rules to follow. Be creative and grow a long goatee as it suits your face shape and style. If you want to go with the new trend, you can try long goatee with the short beard. Here are some amazing long goatee beard styles to inspire your new look. What’s a man on a motor without an outstanding beard? Long goatee beard style has become such a classic look in motorcycle communities. Longer goatees fo really well with motorcycle clothing. Because you’re probably going for a bold look, you should add a pair of black sunglasses. If you wish to achieve that perfect motorhead look, it’s a great idea to shave your hair as well. If you’re the type of man who enjoys following current trends, then a long goatee with a mustache is an excellent choice. Goatees are usually not something that we typically associate with the hipster culture. But, if you do it right, this beard style can easily be incorporated into your look. The most important step here is to make sure your mustache is as fabulous as your goatee. You probably know what comes next in this look: adding a pair of black frame square glasses and combing your hair to one side. You can also try this long goatee with a short beard. 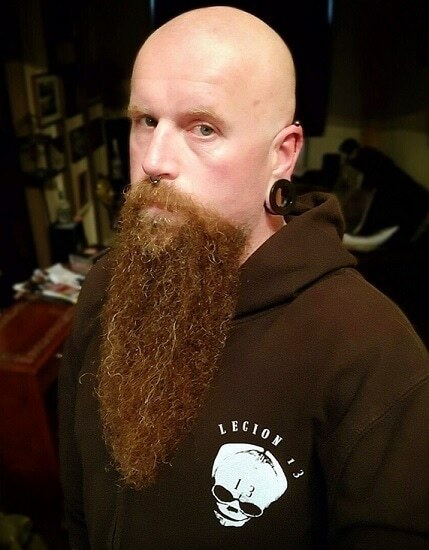 People who love to brag about their amazingly long goatees are most certainly metalheads. Let’s be honest, they really do have something to brag about. If you’re ready for your transformation into a motorhead, it’s time for you to start growing out your goatee. There are no limits to how long should the beard be. It should be as long as you can handle it. Just make sure that you wash it properly and frequently. You should definitely consider shaving your head to pull this off. If you don’t shave it, there will simply be too much hair everywhere. All gentlemen should have impressive beard styles. Long beards signalize that you’re really masculine yet that you also care about your look. If you’re blonde, it’s much easier for you to achieve that gracious look. Always brush your goatee and often apply some beard styling balm. In this look, the long goatee serves the purpose of making your face look sharper. That’s because the classic gentlemen appearance is all about looking sharp and polished. More laid back style of a long goatee is perfect for men in their 50s. The beard shouldn’t be styled too much, you can leave it a bit bushy. Men whose beards start getting grey while their hair is still dark are particularly attractive to women. This grey beard draws the most attention when it’s styled in a goatee. For this look, you can keep your hair medium length. It will add to the laid-back look that you’re going for. Men who have dark hair and choose to grow it out will always be attractive to women. When you add a goatee to that equation, you have a perfect man. In this look, keep your goatee long, but not too long because we don’t want it to steal the spotlight. Having long hair is enough already, so don’t go crazy with the beard. In this look, both the hair and the beard frame the face which creates an irresistible appearance. Long square goatees are great for men who are seeking to define their facial features or to make them appear sharper. A square goatee gives more symmetry to the face. Even if your facial features are not perfectly symmetrical, you can overshadow that by carefully styling your beard. This beard style is a perfect choice for bald men. The long square goatee will draw all of the attention as it becomes the most defined part of your face. Once you reach your 50s and 60s, it’s expected that you’ve done your fair share of experimenting with beard styles. If you’re asking yourself what to do next, sometimes the best answer is the most simple one. You could opt for a classic long goatee style. This beard style should be accompanied with a gorgeous pompadour. This killer combination will ensure that you look classy and appropriate for your age. Men who have fantastic cheek and jaw bones don’t have to try hard to put them into the spotlight. However, a lot of them become too obsessed with these facial features, so they try to make them the focal point of their face. If you want to be unique, you can choose to put your goatee in the spotlight instead. Your crazy amazing jawline will still be visible, but this way you will never come off as someone who brags about it. Let’s be honest, you really need to have an iconic look when you’re trying to pull off this long goatee beard style. Firstly, it’s impressive that you can even grow a beard this long. So, why not use that to your best advantage. Besides, braiding your beard is very convenient because it makes it more manageable. If you’re a person who enjoys attention, then you should definitely try this bearded look at least once in your life. Do you have any question on Goatee? Watch the below video to get your questions answered. When though long goatees have been present for a long time now, we’ve seen incredible twists to the look. As men become even more creative with long goatees, we will see much more men choosing to have it.